The Korean medical community is seeking to combine artificial intelligence (AI) with their profession rapidly. 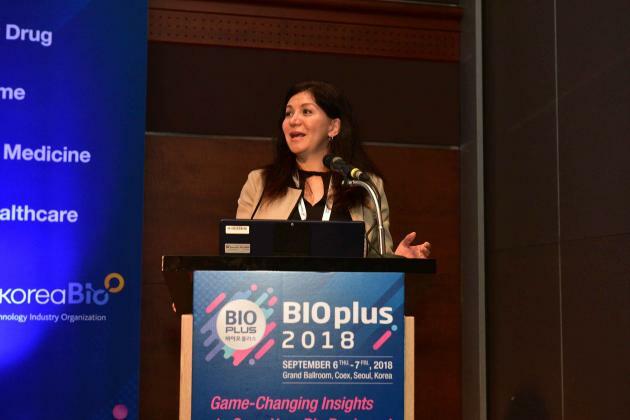 Outcomes4Me CEO Maya R. Said explains the importance of good data in using AI for drug development, during the Bioplus 2018 held at COEX, southern Seoul, Thursday. However, some experts have raised concerns about on the undue reliance of developers on AI, during an “AI & New Drug” session at Bioplus 2018 held at COEX, Seoul, on Thursday. Therefore there is a lot of so-called unwanted signal or noise in the data, which can alter the outcome, she added. Outcomes4me is building an integrated platform that provides patients and their families with new ways to navigate healthcare systems globally. Said stressed that AI is emerging as a savior to solve all the problems in the development of new drugs, but this is merely an exaggeration. Said gave IBM’s Watson, which helps diagnose and treat cancer in Korea, as an example. “When Watson first came it was thought by many that the device would cure all human illnesses,” she said. “In reality, however, this did not happen, and more recently the device has presented some problems.” This is because of exaggerated data and proves that a single technology cannot cure every illness, she added. Andrew Radin, the co-founder of twoXAR, an artificial intelligence-driven drug discovery company, agreed that AI is just a tool in discovering new drugs. Companies that apply AI also work with other companies to complement the solution, he added.